Creating such a room, or even capturing a degree of cinematic experience in a living room, is often more involved than just installing the right equipment. 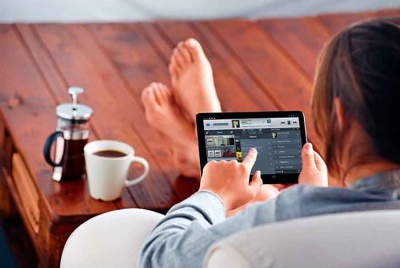 Claire Lloyd looks at how to make the most of media systems at home. A trip to the cinema is no longer touched by the glamour it once possessed, with commercial cinemas often filled with overpriced popcorn and noisy teenagers. Furthermore, with new films typically out on blu-ray almost as soon as they’ve left the big screen, it’s easy to see why a home cinema is becoming an ever-appealing option when self building, or improving a home. If you decide on a dedicated room when building from scratch or converting/extending, then approaching a specialist installer (ideally one approved by the industry body CEDIA) at an early stage is a very good idea. 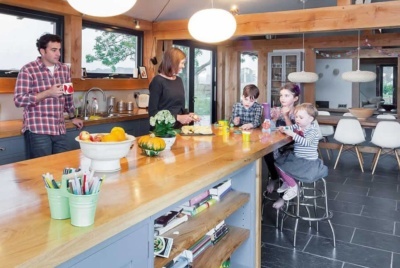 “This should really be before the architect or designer has readied plans to submit for planning permission,” says Matt Wayne of Finite Solutions. And the reason for this? Well, it’s to ensure you get what you want from this room in the first instance as both the room size and shape will impact on what can be achieved. 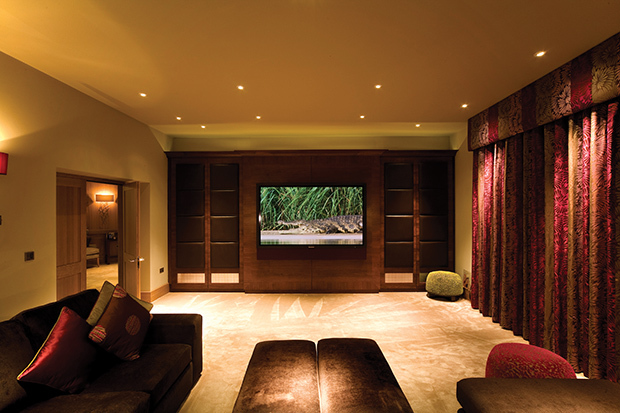 Rectangular rooms are great for cinema rooms. Square rooms are not insurmountable, but achieving good acoustics becomes a more complex job. If you want tiered seating, the ceiling height will need to allow for this. Use the number of people you want to seat as a starting point for size as this will have a bearing on screen size and seat positioning. There’s some simple maths involved in calculating where seating should be positioned. Two lines should be drawn from the seated position to the edges of the screen; this is the viewing angle. Ideally this angle should be 35° — any greater than 40° and the experience will be impressive but feel far too big for the room, making you feel that you are too close to the screen. On the other hand, a viewing angle below 30° will mean the rest of the room enters your peripheral vision, affecting your view. House plans should also provide provision for a dedicated space for the source equipment. This is the equipment you’ll play or source your media from, which may include a blu-ray player, Sky+HD box, film server (such as those by Kaleidescape), gaming console or DVD player, etc. “It’s a good idea to store this outside a cinema room on proper racking in a cupboard or store area near-by,” says Iain Shaw of Brilliant. This is of particular importance too if you hope to stream movies or Sky+HD to other rooms. In higher-end cinema rooms, you may also have to consider where you locate the projector. Entry to mid-range projectors from the likes of JVC, Epson or Hitachi, are fairly quiet and will cause no disturbance in the room. Some of the bigger, high-end projectors are noisy and produce quite a considerable amount of heat. 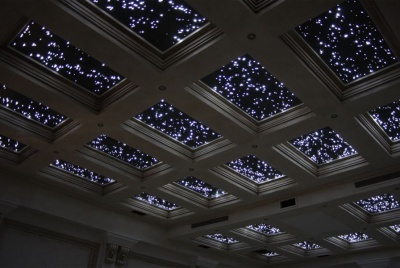 Placed in a separate projector space or mounted in the ceiling, with heat vented externally. Planning in advance will also provide the opportunity to neatly conceal speakers without having to later rip back plasterboard and add in power points and cabling. Most of the work which goes into creating a cinema room lies behind the scenes — with equipment discreetly hidden from view. Building in speakers and drop-down screens and projectors can all be done with considerable ease if planned from the outset. 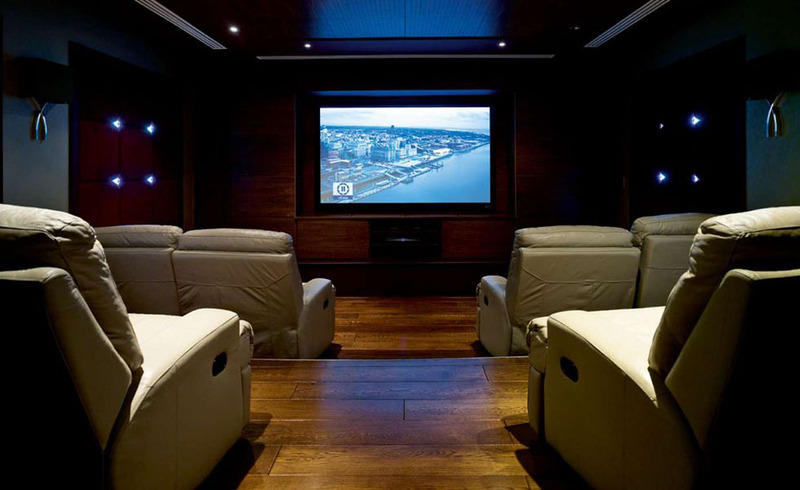 Surround sound is key to the success of any cinema room. This is delivered via speakers, located so as to distribute different layers of sound. Most cinema rooms use 5.1 surround sound. This set-up includes five ‘satellite’ speakers, typically with three speakers located around or behind the screen – left, right and centre (the centre delivers the bulk of the dialogue) – and two rear speakers. The ‘one’ in this equation is the subwoofer; it provides the all-important low-pitched frequencies or bass. There’s also option for 6.1, 7.1, 7.2 and so on. But, more speakers does not equate to better-quality sound. “If you’re on a set budget, it’s better to opt for a high-quality 5.1 set-up, than entry-range 7.1 speakers,” says Bespoke Home Cinemas’ Gifford Malcolm. The room and build acoustics are important in ensuring that sound does not reverberate around the space, or indeed escape outside. The latter is particularly key if you hope to avoid booming sounds disturbing others in the house or even neighbours. A double layer of acoustic-grade plasterboard (try Gyproc SoundBloc) with green glue sandwiched between is effective. Green glue takes acoustic energy and turns it into heat. Also try added further insulation to walls or soundproofing strips to doors. Acoustic wall panels are a good addition. Each passing year seemingly brings ever larger TV screens. A 42-inch plasma TV can be picked up for as little as £500 now. When it comes to TVs, choices include LED TVs (in basic terms, the next-generation LCDs) and plasma. Plasma screens tend to provide better quality for action and sports but are on the way out (Panasonic have announced they’re ceasing plasma production). Look for full HD rather than HD-ready models. Avoid being an early adopter of new technology. Try and buy models which have been around for eight or nine months as they will have more reviews and the price will have come down. 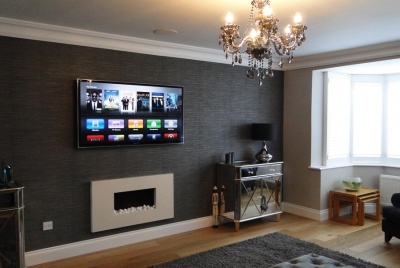 Slimline LED TVs are easy to mount on walls. Samsung is a popular brand among our experts. But even the largest TVs can’t rival the size of the largest projector screens. “One of the first things we’ll ask a homeowner is what size screen they’re hoping to include. If they’re looking for one much larger than 100 inches then the only way to achieve this is with a projector,” says Face to Face Digital’s Will Brocklebank. It is more critical to get the light levels right in a room with a projector. A projector lamp will burn out after around 2,000 hours of use. If you need a screen to double for everyday use, a TV may be more suitable. Specifying a projector and screen brings with it a new level of complexity so seek out expert help from the outset. For optimum audio results, many of our experts advise on placing speakers behind the screen — requiring an acoustically transparent screen. They’re invariably more expensive, particularly if opting for a drop-down option. If you do not have the space, budget or inclination for an entire room dedicated to cinema, good cinematic results can still be achieved in a media room, living area or snug. 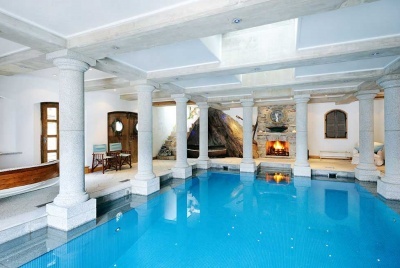 But you’ll face a different set of challenges here where interior design may be a priority over the media experience. Hard surfaces which reverberate sound around the space such as stone floors, large folding sliding doors are common in these spaces. Choose a quality A/V receiver (also known as an ‘amp’) which, in very basic terms, decodes surround sound and feeds it to the correct speakers. Speakers which can be colour matched to walls or covered by artwork (check out artcoustic.com) come into their own here. 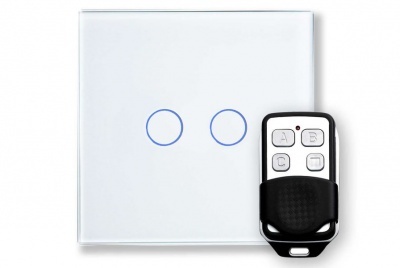 Products such as Amino’s AIWX Dual Channel Series of Plaster-In Invisible Loudspeaker can be installed within a wall and skimmed over with 2mm of plaster. A drop-down screen and projector for evening films, gaming and watching matches is a great idea too. A quality soundbar, which contains all speakers in one slim unit can be neatly mounted beneath the TV. 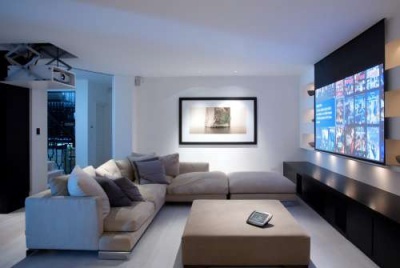 Costs depend on what standard you are going for; whether the system is integrated into a living room or separate media room; and whether you are going for TV or projector systems. Entry level: You can get a good set including a TV, A/V receiver, speakers and control for around £2,000–£3,000. 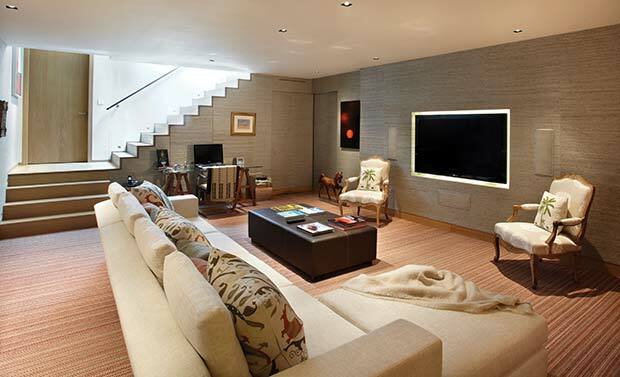 Mid-Level: For a mid-level dedicated home cinema or a high end living room set-up, budget £15,000–£40,000. High-end: The sky really is the limit — Triton projectors (used in professional screening rooms) alone cost nearly £100,000, for example. If you do opt to specify your own equipment, then do ensure you get up on products and the topic first, particularly if mixing and matching different brands. 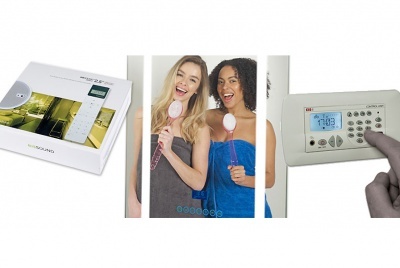 An all-in-one system is invariably an easier solution, albeit more expensive. One area which experts agree is a key place to direct a modest budget is in establishing a good cable infrastructure during the build. Including a well-designed wired infrastructure is a good investment and saves the need to rip up all the plasterboard for later changes. Wireless connection can be deployed, but activities such as streaming films or programmes really need stable bandwidth provided by a wired connection to the internet. 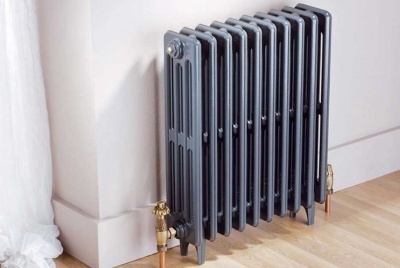 A specialist installer can design this for you — for around £1,500-£3,000. They will take into account potential future uses of each room to ensure you have ample coaxial and internet points and power points. The drawings will not only be used by your electrician, but will also act as an important cabling ‘map’ for future installations. Ethernet Cabling Not all cabling is the same quality. “Ensure you specify solid copper Cat5e. Cat5 CCA (which sometimes carries the ‘Cat5e’ labelling) is around a third of the price, but is actually copper-clad aluminium — try introducing audiovisual to the house with this and you’ll find it just doesn’t work well,” says Bespoke Home Cinemas’ Gifford Malcolm. Cat6 may be a wise investment (it costs around 20% more) as it offers a larger bandwidth, which is likely to be required when 4K TV takes off.